Allegory, or extensive use of symbolism in a moralising story, has a long tradition in Christian literature. 'The Desert of Religion', a poem in a northern English dialect, uses the symbol of a forest to expound the daily spiritual battle of virtue and vice. This copy has tinted half-page drawings of devotional figures with verses inscribed around them. Facing them, diagrams in the shape of trees bear the names of virtues and vices on their trunks and leaves, giving visual form to the poem's allegory. The book was made for a religious community, the location of which is now unknown. A diagram of the tree that is celebrated 'in all holy churches' or Faith, has acorns sprouting from its top and along the sides of its trunk. The inscriptions on the leaves seem to be related across the trunk, with actions on the left, consequences on the right. 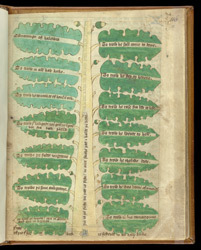 The 'trees' depicted in the diagrams are always located in places of religion rather than in secular environments, which is another way in which the book appears to be connected to a monastery or nunnery rather than to lay ownership.